SOUR TANG HAS MOVED TO: THEKELLYTANG.COM: It's Pre-Fall Already?!? No surprise that the fashion industry moves at a super fast pace, but it's pre-fall all over again, even though not going to lie, I wish we could just stay and mnove into the warmer weather. Today is an absolutely gorgeous MLK day, ah, I love this weather. Thakoon. I love these bright prints, they are so fun, and they are more edgy with the black edging around the last dress. I am such a fan of feminine + edgy combos. I want this jacket and the skirt too. The drape of the jacket is just exquisite. Alexander Wang. 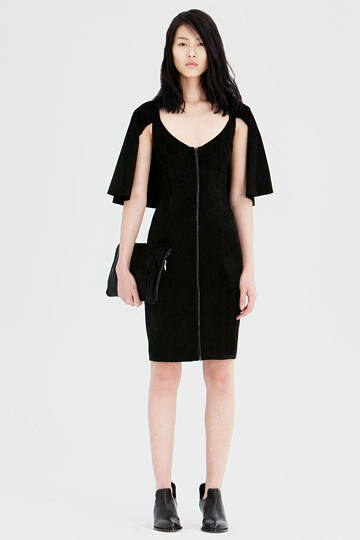 I love the simplicity that is A. Wang. I love the combination of soft knits, with the structure of the trench coat in the fourth look. I'm predicting chunky, cropped knits for fall 2010, and beyond. Note: I totally have seen pre-fall a longg time ago, I just forgot,, wow.. way to go me. lol. but i'm finally doing a post for pre-fall, even though I swore I did. Is this what old age feels like? ok, I'm going to watch a basketball game soon, so I'll update with more pre- fall looks later.